Hey guys! It's that time again - Friday Five! Yay for Friday! 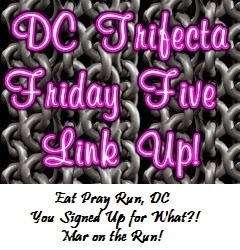 I am linking up with the lovely DC Trifecta for Friday Five: Courtney at Eat Pray Run DC, Cynthia at You Signed up for What?, and Mar at Mar on the Run. 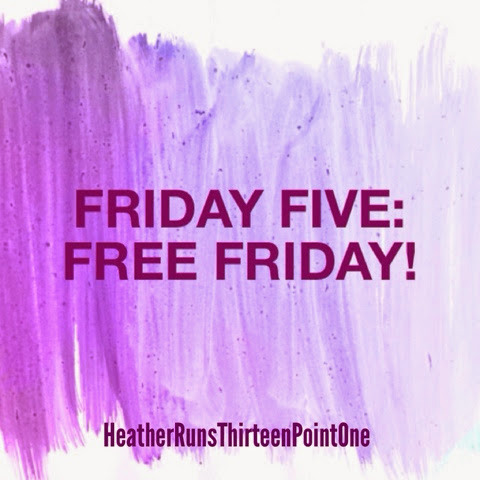 This week's theme is "Free Friday". Uh-oh. That means I have to come up with something on my own... haha. Here are some random thoughts/things I liked this week. 1. Christian Stoinev on America's Got Talent. I don't usually watch this show, but there's not much on in the summer, so this show has been getting more views in our house than usual, especially when we are just eating dinner and don't really have the time to get in to anything involved, like starting to binge watch a tv series. Anyway, this guy did an act with his dog, and I just loved it! If you don't know by now, I am a dog lover, and this dog was just so awesome. I can't get over it. If you don't feel like watching the intro, the act begins at about 1:15. 2. Bar Method class. Pure Barre didn't have much availability in their classes, my friend and I found another class that actually is in a better location (for our travels home) and offered more classes/times to fit in our schedules. We gave it a go this week, and today will be day 3. I'll do a post about it, but overall, I am really digging it. Even though it's still crazy hard, I feel like it's a little less intense than Pure Barre (read: I don't usually feel like I'm going to pass out), and I get more instruction on form/positioning, which I need/ like. 3. Nephew time! This weekend I have the privilege of hanging out with my nephew while my brother and sister-in-law go out on a date. I haven't had a chance to see him in a while, so I'm so very glad they asked me to watch him and that I was actually free! That's quite rare. 4. I have a new book to read: 'The Cuckoo's Calling'. Anyone else read it? Did you like it? It was written by JK Rowling under her pseudonym, but was later revealed that it was her (not sure under what circumstances... was it leaked?). 5. Cross training update. I had talked a while ago about starting to swim as cross training, but since I decided to do a month of classes at Bar Method, I couldn't afford to also buy the gym membership on top of it. Not to mention, I wouldn't have much time to go. I'm already pretty exhausted from running and bar classes, so I think I'd really be stretching myself thin if I also tried to do something else on top of those. Once my month of classes is up (unfortunately I won't be able to keep it up at the moment... $220 for classes is just to steep for me right now), I plan on joining the gym and getting my swim on. The gym also offers spin, yoga, and PiYo classes, which I'd like to try. What do you have going on this weekend? What's your favorite kind of cross training? Yes - I really enjoy it (well, in the aftermath at least haha). I don't think they offer the barre classes here, but I just ordered PiYo and am really excited about trying it out next week! Awesome! Looking forward to seeing how you like it! I loved Christian's act with his dog! I am teaching my dog "freestyle dancing." He is a big greyhound and only graceful when he runs, so it is pretty amusing. But he loves to learn new things, so it's fun for both of us. I guess my favorite cross-training is cycling, even though I NEVER would have said that 2 years ago! It's funny the things we start to love when we didn't think we would. I didn't think I'd be such a running fanatic! Do you do indoor, outdoor, or both? I do not do enough cross training. I need to find something else to do other than running all the time to mix it up. That's why I started! Also, thought it was a good idea to help mature other muscles that running doesn't use to balance out my body, along with hoping to help strengthen those that would help me become a better runner (like the core). That little dog totally had me laughing with the begging for applause! I'm running in a race on Sunday, and otherwise pretty much relaxing this weekend. Me to! So darn cute. I hope your race yesterday went well! My favorite kind of crosstraining is the elliptical machine. It's a bit boring, but I have one on our balcony so it's so easy to do! It sounds ways less boring being on a balcony – I bet it helps having some distractions. I'm running a race on Sunday as part of a training run. I love swimming and spinning as cross training. Elliptical is nice too! The enjoyment of the class often depends on the location and staff – you sometimes never know what you'll get! I thought they were super nice at Pure Barre, but didn't feel like I got the instruction I needed. That's great that you found a location that works well for you and that you prefer :) I love hearing about other people's experiences! I have heard of Pure Barre but really don't know anything about it. Bar Method sounds like another great option. I'm really starting to learn to love the cross training as a supplement to running. Wish I had a place to swim, right now I mostly bike in between run days. Biking's a great form of cross training! That's awesome that you are able to mix it in with your training on non-running days. I had done a bit of research, but I still wasn't quite prepared for what the classes entailed. They were much more difficult than I was expecting, but really like the exercises and am already noticing some muscles toning up :) Yahoo! I love Body Pump and Yoga Sculpt, which is hot yoga with weights (but not bikram hot) gets the toxins out and feels great!